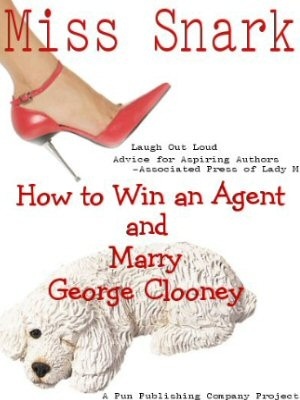 Miss Snark, the literary agent: Where Have I Heard That Before? I have an idea for a novel or screen play, and I'm so excited about it that I'm just about to begin putting pen to paper (or fingers to keyboard). I can visualize the story so vividly in my mind that I'm a bit concerned that maybe I've read or seen it somewhere before. I think it's my very own story, but perhaps I didn't think it up after all. What's the best way for a writer to check that he or she isn't unwittingly stealing someone else's idea? You can steal every idea in the book and be ok.
What you can't steal are the words. You can steal the idea of doing a blog about publishing. You can't steal my actual posts to this blog. You can steal the idea of star crossed lovers come to a bad end. You can publish it as Romeo and Juliet, then West Side Story. You can steal the idea of an aging patriarch confronting his mortality and his daughters. You can publish it as King Lear and then A Thousand Acres, and then Belly. Try to write as well as Jane Smiley or Lisa Selin Davis and you're good to go. Fiction is synthesis. Take every book you've ever read, combine it with everything you've ever experienced, and jot it down using every word you've ever loved. That will be original work, guaranteed. "immature writers imitate, mature poets steal." you can turn romeo and juliet into west side story, and shakespeare ripped off of his plots from secondary sources. i have had a friend's idea stolen -- she had a specific structure and narrative for her grad-school novel, only to see a supposed friend (who she had confided in) write a book with the exact same structure and plot. but that's different than stealing old plots, structures, or such. you can even take famous characters and reinvent them. it's not like robin williams stealing jokes. I had an agent tell me one of my books reminded her of something that had already been published. She mentioned the title and I searched it for a day to see if she was correct. I found nothing at all that remotely resembled it. I also knew it was completely original. Stealing doesn't work; so many television shows have tried to steal the concept of American Idol and they are all painful flops. Copying ideas is fine… unless and until you cross the border into California. Getting inspired by a film to create something new is ok, but taking a film's structure (if that's the "idea") as the foundation for a written work could prove dicey. And if you're dealing with Hollywood in any fashion, "ideas" do count. Under California law, the only real winners are the lawyers, because any dispute (even if it never becomes a lawsuit, let alone if it does) is going to result in alpha-male-gorilla posturing at several hundred dollars an hour. There's some weirdness in the movie industry where people can (and do) sue for having their ideas stolen. My brother the TV writer claims that it's not exactly like having copyright on your ideas but from the outside it sure seems like it. Belly was a great book: King Lear in upstate New York. Bill E: Hey, Mistress! Do I have a great idea for a novel noir. Bill E: Just listen, will ya? But this is set in Pennsylvania. And there's this guy, they call him the troll because of his Internet habits, and he guards the portal of the favorites. Bill E: Don't be silly. Portals are never passe. Besides, this is a regular door, got it? But it's to a disco. You're admitted and you're on your way to fame and fortune. And I'll crush you to bits, body and bones. Bill E: How'd you know? Seriously, how did you know? On the other hand, if you're just trying to avoid coming off as derivative, you could always try searching the plots at IMDB for a couple of keywords. Or going to some pop-culture focused message board and posting something like, "I'm trying to remember the name of a movie about a guy who loses his nose and goes on a cross-country trip to look for a replacement. Anybody know what that was called?" If it exists, they'll tell you. "There is nothing new under the sun." JTC, you forgot the second part of that quotation: "Everything is chasing after the wind." mh-shyh hv` syhyh vmh-snjsh hv` syjsh v`yn kl-xds txt hsms.ys dbr sy`mr r`h-zh xds hv` kbr hyh ljlmym `sr hyh mlpnnv. That is such horseshit. Steaming, fragrant horseshit used as an excuse by people who can't think of something original. There are plenty of new things to write about every day. All you have to do is pay attention to find them. Sometimes "innovation" means "stealing another's secret before anyone else can." Irony bonus: I copied that phrase from a trading card. Originality operates only as a place holder, identifying the future location of history’s next great plagiarism. Listen to the Wise One and "steal away." It is a truth universally acknowledged, that stately plump bucks, are often called Ishmael. How can anybody seriously say there aren't any new ideas? Where did all the ideas that are currently recycled at one point come from? Somebody at one point created them. So did all of a sudden, we collectively lost the ability to create? A thousand years from now there will be nothing new? "There are plenty of new things to write about every day. All you have to do is pay attention to find them." I don't mean you go out overturning rocks. You find the ideas within yourself, in your mind. It's an internal process. Like that other guy said, do you really think nobody today is able to create anything original?